Aizawl, Feb 6 : Mizoram has the highest cancer incidence in the country, State Nodal Officer for Non-Communicable Diseases (NCD) Dr Eric Zomawia said as the State observed World Cancer Day yesterday. 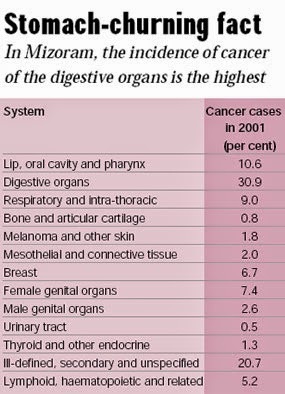 Zomawia said that Mizoram has a very high incidence of stomach, esophagus, lung and cervix cancer. “At least 3,137 people died due to cancer in the State during the past five years while 5,888 people suffered from cancer during the period,” he said.